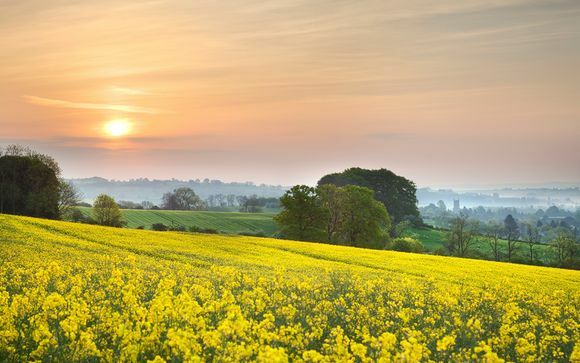 The Cotswolds is an Area of Outstanding Natural Beauty, it’s Britain’s largest at 790 square miles (2038 square kilometres). Oolitic limestone is responsible for the “honey” coloured cottages which dot the landscape and the Cotswold stone walls which punctuate the rolling hills. It’s an area of warmth with open skies, rolling grasslands, Beech woods and charming villages. There are miles and miles of walking and cycling routes, an amazing variety of events, festivals and numerous attractions from stately homes to magnificent gardens, farm parks to vistas. The Cotswold Way runs from Chipping Campden in the north of the district to the glorious city of Bath in the south, the 102 mile path is a great attraction to many, many visitors throughout the year. Mickleton is just a few minutes’ drive away from Chipping Campden once described by Pevsner as “The best piece of townscape in Gloucestershire, arguably one of the best in England”. The town’s wool legacy can still be seen today in St James’ Church and along the high street. Once you discover The Cotswolds you’ll wonder why you haven’t discovered it before! 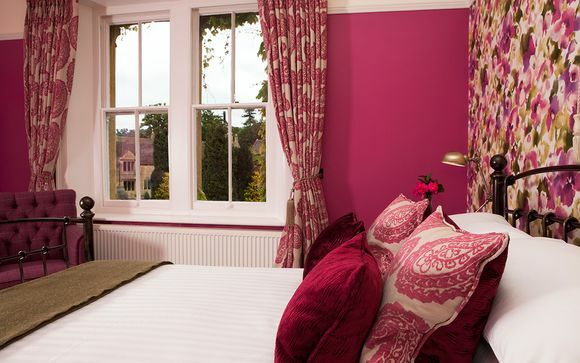 Three Ways House is a Cotswold village Hotel in Mickleton near Chipping Campden. It's world famous as Home of The Pudding Club® located on the northern edge of the Cotswolds, UK, 90 minutes from London, 10 minutes from Shakespeare's Stratford upon Avon, it's the closest hotel to Hidcote Manor Garden (National Trust) and Kiftsgate Court Garden, both are 5 minutes away by car or a 30 minute walk away. Stay in this privately owned Cotswold hotel, this is the 21st year Simon and Jill have owned the hotel, and enjoy some great food in the AA Rosette award restaurant, or the more informal Randalls Bar-Brasserie. You'll experience high levels of hospitality, delicious food and comfortable rooms. This offer is based on a Superior Room. The Superior rooms have Bose or Vita Audio systems, towelling robes, and Molton Brown toiletries. Each bedroom has a shower and/or bath and is equipped with tea/coffee making facilities, hairdryer, remote control TV, radio, direct dial phone and free Wi-Fi. This offer is based on a bed and breakfast stay. Just for you: a jute Pudding Club bag with a family size Pudding Club pudding, 1 night stays get 2 glasses of Prosecco with a sharing Plate of 3 Pudding Club puddings , 2 Night stays get a bottle of Prosecco with a sharing Plate of 3 Pudding Club puddings. The hotel’s AA Rosette award winning Restaurant is open every evening for dinner and offers a delicious menu using fresh, seasonal produce, sourced from in and around Chipping Campden and the locality wherever possible. Pudding Club puddings are always featured on the Restaurant and Randall’s Bar menus, you may be able to sample the delights of Summer Pudding, Passion Fruit Charlotte or Eton Mess as well as all time favourites Syrup Sponge Pudding and Sticky Toffee Pudding. Exit at junction 15 and take the A46/A439 to Stratford–upon–Avon. Follow signs for Broadway and Shipston–on–Stour and take the A3400 out of Stratford–upon–Avon. Almost immediately break off the A3400 by turning right onto the B4632 to Mickleton. Exit at junction 7 and take the A44 to Evesham. Follow signs for A44 Oxford (this will involve a right turn at traffic lights, then 1st exit at the first roundabout, straight across the next roundabout then 3rd exit at the third roundabout). Stay on the A44 for about 4 miles turning left at second roundabout onto the B4632 to Mickleton. Exit at junction 9 and take the A46 to Evesham, approx 9 miles. Follow signs for A44 Oxford (this will involve taking the 2nd exit at the first roundabout, straight across the next roundabout then 3rd exit at the third roundabout). Stay on the A44 for about 4 miles, turning left at second roundabout onto the B4632 to Mickleton. If using a Sat Nav we recommend you enter High Street, Mickleton.